William Boyd retired in Palm Desert. 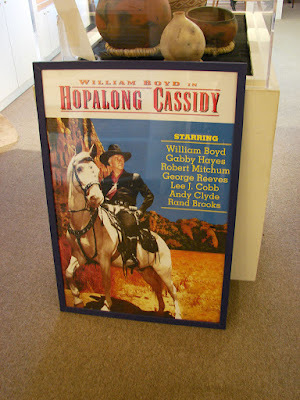 He had been Hopalong Cassidy in the movies. Rumor has it that Frank Bogert wanted the part of Hopalong, but lost out to Boyd. Please if you have any juicy tidbits about Palm Springs, drop a comment or two. 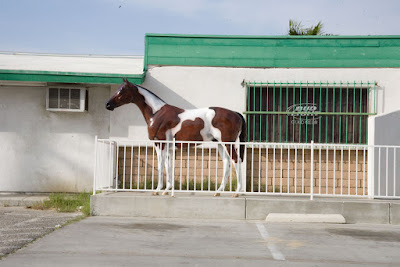 Out in DHS (that would be Desert Hot Springs) there's a horse to greet you at one establishment. I took this picture a couple of months ago and for the life of me, I can't remember where it was. Maybe Palm Av? Or Pierson? At any rate, the city of DHS is looking for businesses to set up shop on Pierson Blvd (that would be DHS's main drag. 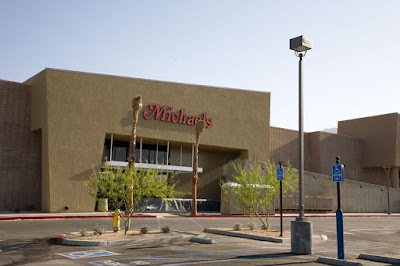 Now this store, which is coming to Palm Springs, is exciting. We'll actually have an art supply store. Everyone loves art! 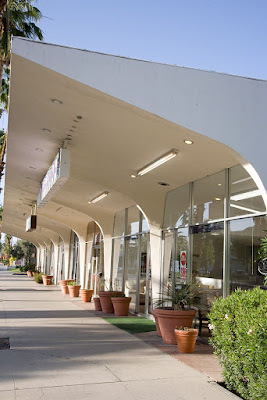 Mac Magruder Chevrolet had been a Palm Springs landmark for many years. Dumb me didn't notice when it closed down. Anyone know? 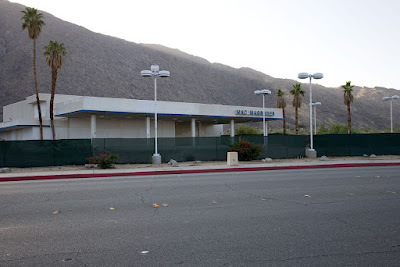 What's happening to all the car dealerships in Palm Springs, anyway? Well, for one, they've moved to Cathedral City. Gone are the days when you'd roam Palm Springs and look through the floor to ceiling glass at the latest Chevy. 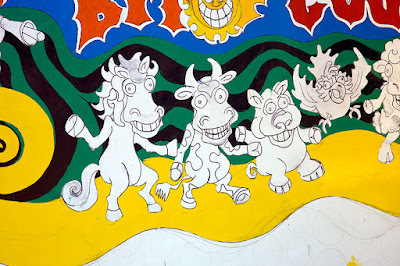 They're drawin' up a new mural at Bit 'O Country in Palm Springs. Bit 'O Country is one of my favorite breakfast haunts. I love the place cause they cook their bacon well-done and they have grits. I love grits. I put sugar on them. They also have biscuits and gravy, which I don't like. I've gone with people, though, who've ordered them and said they're some of the best. Doncha just love breakfast restaurants. What's all this that I hear that gas is isn't yet $4 a gallon. 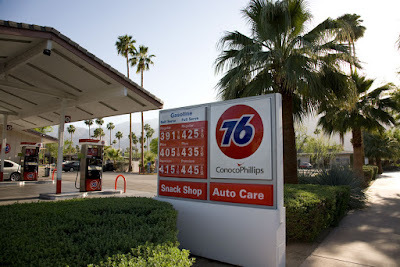 We're paying that here in beautiful Palm Springs. I have a hybrid and it's still $40 to fill my tank here. I shouldn't complain though--a Hummer owner probably pays nearly $100. Playing the guitar on the street has to be bliss. This street fair musician's pretty good. 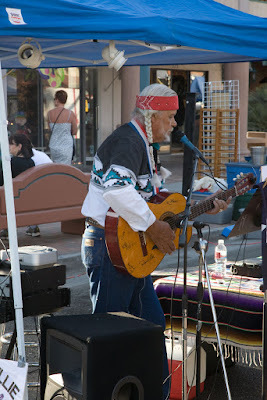 You can hear him on Thursday nights at Palm Springs Village Fest. He's located at the east end of the fair near Baristo. I wish they had more entertainment on Thursday nights, maybe a band or jazz. Justin Blake used to do an event right in the middle, but I can't remember what it was for. The fair needs some spicin' up. It's kind of stale. 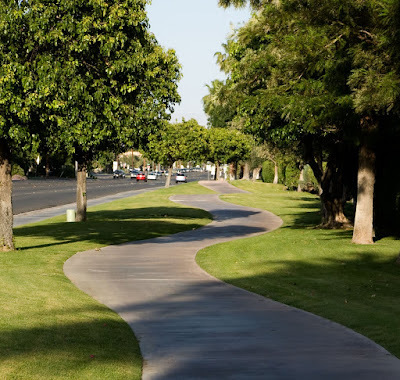 I never appreciated the curved sidewalks we have here in Palm Springs, until my partner's mother pointed out how much she liked them. If the Coachella Valley had a sexual orientation, it'd be a gay man, it's so well-groomed. Everything here is meticulous, every vacant area of most of the desert cities is landscaped with plants, that with a little water, thrive in the desert. I guess we have to get the tourists here as it's our livelihood. This type of building has always been one of my favorites. It has everything mid-century--the concrete soaring into a overhang and the floor-to-ceiling glass. Notice, too how the occupants put clay pots outside each doorway. Clever! This building is located on Indian near Ramon. When I took the picture I tried to line up the roof line with the left edge of the frame. I'm thinking of cropping out the sky. What do you think? Ahhh, verrrry interesting. 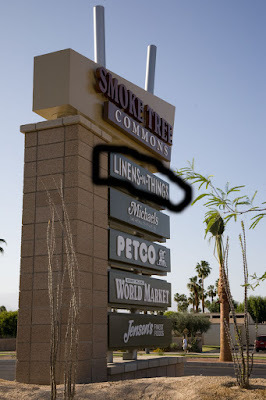 Here in Palm Springs we have a new strip mall coming in, which will include a Linens-n-Things. Only last week Palm Springs Daily Photo noticed that Linens-n-Things is bankrupt and closing stores. My only question is why is this one opening? I'd like to think Palm Springs as a special place where bankruptcy doesn't exist, but with so many empty storefronts here, I find it difficult to believe that a chain would open a new store here of all places. Is it because a high population of gay people are here to snap up the latest 400-count cotton sheets? 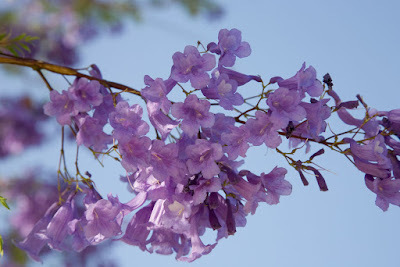 Isn't the purple flower against the blue background lovely. These flowers are in bloom now, and I haven't got a clue as to what they're called. I'm so glad there are people who lend a hand out there in helping me identify the plants of Palm Springs. The desert has so much more than just tumble weeds.